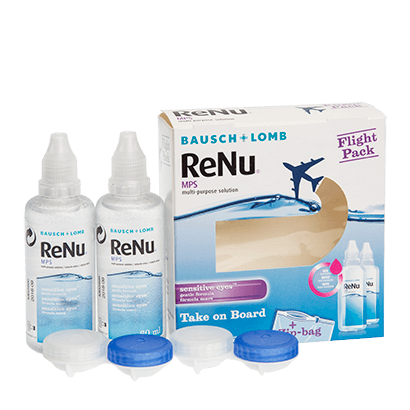 Flying shouldn’t be a hassle when you wear contact lenses, so make travelling with them easier with the ReNu Multi-Purpose Solution Flight Pack. The pack contains two 60ml sized bottles of multi-purpose contact lens solution alongside two contact lenses cases, as well as a zip-up bag for storage. The bottle capacity fits well within cabin luggage restrictions, making it the ideal choice for a holiday. With ReNu Multi-Purpose Solution Flight Pack, you can be certain that your weekly or monthly contact lenses will be cleared of protein deposits, lipids and other debris while on the go. Nothing will obstruct your vision or your day, while you can also enjoy complete comfort due to the solutions highly moisturising formula. Made by Bausch & Lomb, its expert cleaning properties ensure that your lenses are disinfected and kept clean during storage, ready for when you need to rinse and put them back in the next day. The ReNu Multi-Purpose Solution contains only a very mild preservative called DYMED, making it kind to even sensitive eyes. This ingredient also aids with rewetting your contact lenses during storage, ensuring they’re wettable and comfortable to wear. Need more than just a travel pack? Why not buy in bulk and purchase our ReNu Multi-Purpose Solution Triple Pack or standard bottle of solution?